The most detailed image of Ultima Thule returned by New Horizons reveals surface details, including pits on both the object’s lobes and contrasting patterns of darkness and light in various regions. Taken by the wide-angle Multicolor Visible Imaging Camera (MVIC), part of the spacecraft’s Ralph instrument, this latest image, sent back on January 18-19, has a resolution of 440 feet (135 meters) per pixel. It was taken at 12:26 am EST on January 1, just seven minutes before closest approach, from a distance of 4,200 miles (6,700 km). 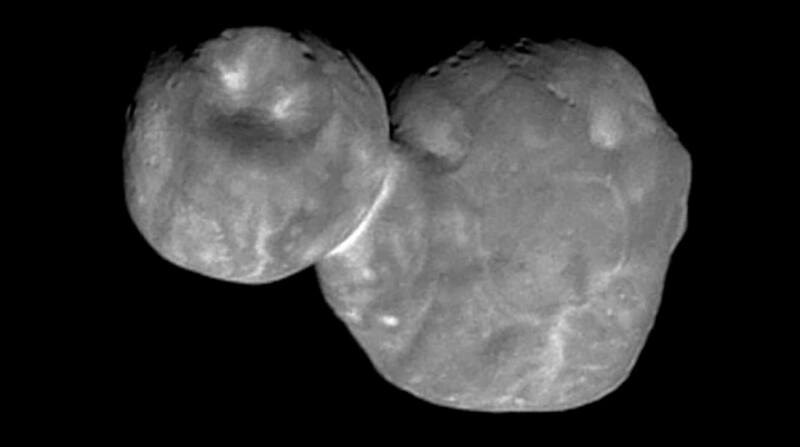 Mission scientists enhanced the image in a process known as deconvolution, to bring out the details on Ultima Thule’s surface. Near the object’s terminator, the line that separates its day and night sides, many small pits estimated to have diameters of 0.4 miles (0.7 km) are visible. These could be either impact craters or the results of collapses caused by the venting of organic molecules in the KBO’s earliest days. Contrasting regions of dark and light are present on both of Ultima’s lobes, with the brightest being the neck that holds them together. While the cause of these patterns remains unknown, scientists think they could yield information about Ultima Thule’s origin and the merger of its two lobes. On the smaller lobe, a round feature that appears to be a crater with a diameter of approximately four miles (seven km) is visible. “This new image is starting to reveal differences in the geologic character of the two lobes of Ultima Thule, and is presenting us with new mysteries as well. Over the next month, there will be better color and better resolution images that we hope will help unravel the many mysteries of Ultima Thule,” mission Principal Investigator Alan Stern of the Southwest Research Institute (SwRI) in Boulder, Colorado, said. Because New Horizons is about 4.13 billion miles (6.64 billion km) from Earth, signals traveling at the universal speed of light take six hours and nine minutes each way. Return of all the data collected during the New Year’s flyby will take a total of 20 months.